These Traditional Style outdoor tables have a 4" pedestal frame design, and is perfectly suited for high traffic areas. Seats and tops are made with 3/4" # 9 expanded metal inside 2" x 2" angle iron frame, and have round corners for safety and comfort. 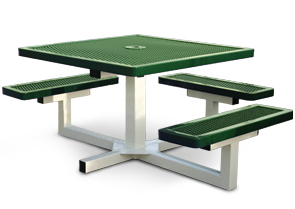 The Outdoor Tables come with 46" square tops with a standard 2-1/4" umbrella hole. 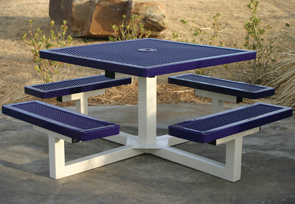 Available in any of the color options shown below, the table top and seats are thermoplastic coated with a lightly textured matte Polyethylene. 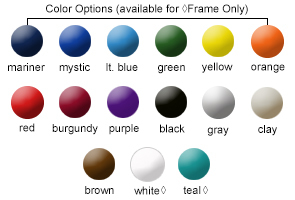 Optional 7-1/2" and 8-1/2" umbrellas are available in any of the color options shown above, in either a single solid color or a 2-color alternating pattern.